L. J. Wing Gas-Fired (GA) heaters with revolving discharges can be mounted at heights up to 105 feet and distribute heated air over an expansive floor area without the use of ductwork. To accomplish this, two or four duct furnaces are clustered around a fan plenum. 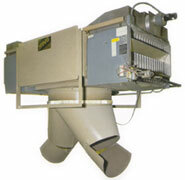 Axial or centrifugal fans are used in conjunction with an inlet venturi to deliver air with low power consumption. For more information, request bulletin GA. Floor coverage up to 21,000 sq. ft.